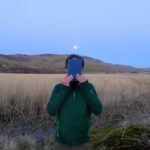 Alec Finlay (Scotland, 1966-) is an artist & poet whose work crosses over a range of media and forms and considers how we relate to landscape and ecology, with a specific interest in place-awareness, hutopianism, rewilding, and wellbeing. Finlay established morning star publications in 1990. He has published over forty books and won seven Scottish Design Awards. Recent publications include a far-off land (2018); gathering published by Hauser & Wirth (2018); th’ fleety wud (2017), minnmouth (2017), A Variety of Cultures (2016), ebban an’ flowan (2015), and Global Oracle (2014).